Looking for fresh apps for your iOS device? 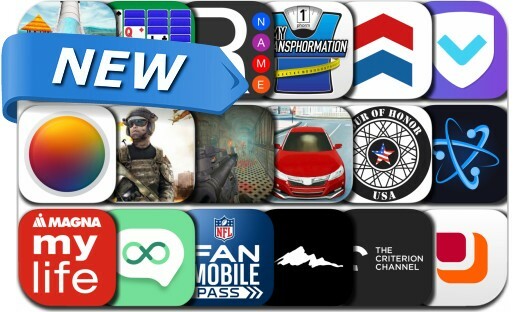 We’ve found 18 top apps that were released recently. Today’s batch of new apps includes Noodle Road, Solitaire Daily, Atom | Piano Roll, Fluent Forever, Battle Stars: Nite, NFL Fan Mobile Pass, VPN Clean, The Criterion Channel and many others. Blow up your enemy by adding item skills to fatal weapons! Don't miss out on the fun with friends! + Online MULTIPLAYER! + Awesome Characters! + Fatal Weapons! + Unique Items! Solitaire Daily is a Funny Card Game. Take on our Daily Challenges for a new Solitaire experience each and every day. Download now to play this classic Solitaire card game. Our Solitaire Daily card game will give you endless fun. And the most important thing is that it is a single player card game and available for Free!